A European- style Beach Resort and Spa, featuring three (3) authentic architecturally designedvillages: Italian, Dutch and French. Each room and suite overlooks the two(2) mile beach. Retail Village with Duty Free jewellery store, Trading Post, Resort Shop, Island Routes Tour Desk &Digital Photo Shop. Free WiFi for all guests occupying ClubSandals or higher categories of accommodation. In a class by itself, Sandals Whitehouse provides a noble escape in a European-style village setting. This resort is truly “the jewel on the south coast” and an ideal location for both adventure travelers and those who just want to relax. All rooms & suites include: Air conditioning, king size bed, amenity kit, hair dryer, telephone, safe, IPod docking station, iron & ironing board, satellite TV, coffee & tea maker. All rooms have tiled floors and mahogany furniture. Rooms include rails in the bathroom (in the tub and surrounding the toilet). Bathroom entrance is wide enough for wheelchair access. Available on request: shower bench & extended shower head. The Club Sandals Lounge is accessible 24 hours with Club Sandals Concierge available between the hours of 8am-10pm to assist with reservations for spas, excursions, restaurants and just about anything. In Room/Suite and Lounge bars with scotch, vodka, rum, whiskey, wine, beer, juices, sodas and water. Complimentary Wi-Fi suitable for emailing and browsing. Room service available from 7:30am to 10:00pm daily. complete with your own personal butler, is the ultimate indulgence. With seven extraordinary restaurants offering tantalizing temptations, deciding on dinner just might be the most difficult part of your day. Impeccable service, mouthwatering international cuisine, and a romantic atmosphere make every dining experience feel like a vacation. With chefs known for their authenticity and dedication to detail, you’ll enjoy the same extraordinary culinary experience you’d expect in the most acclaimed restaurants around the world. And accompanied by the renowned Beringer Wines, every meal becomes a celebration of your love at Sandals Whitehouse. Unlimited day dives are one of the Luxury All-Inclusive activities for PADI® qualified divers (night dives available at extra cost). Beginners can learn how to scuba dive by signing up for the Resort Course ($90). There are daily dive excursions for both beginners and qualified divers. The dive boat is a fully furnished 46ft Newton® – one of the best in the business. Hello my name is Wendi Montoya. I am so excited to be working with Kevin & Meredith on their wonderful Destination Wedding. 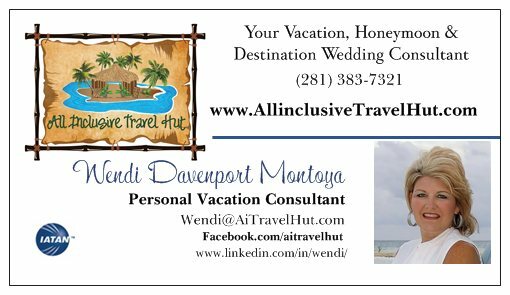 I have been working with Destination Wedding couples for over 9 years. The couple has chosen the beautiful Sandals Whitehouse Resort. Please find resort information on this page. In the coming week there will be a link listed below if you are interested in booking your own room and still get benefits of booking within this group. I look forward to helping all of the guests find the room categories and dates that best fit their travel needs. There is a deposit of $150 – $200pp (in most cases depending on flight carrier). This deposit will cover the air tickets, all inclusive resort and the round trip airport transfers. You will have everything taken care of in one deposited reservation making traveling easy! If you have airline miles, use them! Call and I will take care of the resort reservation. I will need your flight arrival and departure information to ensure your Airport Transfers are setup and waiting for you when you arrive Montego Bay. Please send your dates of travel along with your passport names and birthdays. I will send you a confirmation, please make sure all details are correct. You will need to fill out a Credit Card Authorization form. Please fax it back and we can proceed with your reservation. The final payment will be due 45 days prior to departure. This would be around April 7, 2014. I am happy to work with anyone needing a monthly payment plan. Please call me and let me know how best to assist you with this plan. This is sample pricing and is subject to change. Listed are room totals and round trip airport transfers for 2 people. Airfare is sold seperately and it may be bought thru our agency or individually. There is a group discount being offered to everyone booking with in this group.